My statement concerns the Carson-City-BLM roundup of 575 out of 775 wild horses from the Pine Nut Mountain Herd Management Area (HMA), announced to start on Wednesday, Feb. 6. As a lifelong observer of this unique, historic and ecologically benefiting herd, I strongly protest this unfair roundup. BLM’s studies and documents purport to justify this but are heavily filtered and skewed in order to blame wild horses while overlooking the root causes of ecosystem degradation and conflict with humans. There is a cover-up concerning the major factors that are deteriorating the Pine Nut Mountain ecosystem. As identified through professional assessment, these are: catastrophic wildfire; cattle and sheep grazing; off-highway-vehicle disturbance; clear-cutting of pinyon and juniper trees; littering and dumping of trash, cars, oil, etc. ; hunting and poaching; and predator elimination, among others. My professional report to BLM was submitted through Friends of Animals in a timely fashion, but its proven points have been obstinately ignored by officials covering for the real culprits causing the ecological degradation and human conflict. These officials have chosen to use the horses as scapegoats. Yet they have legal right to this entire 40-mile mountain range as their original herd area. They were present throughout this in 1971, as many, including myself, can testify. The unanimously passed Wild Free-Roaming Horses and Burros Act establishes their right and it is still the law of the land in 2019. So just why are they being squeezed out of their legal home range and forage, water and shelter resources? The current population represents hundreds of habitat acres per individual wild horse! Why is BLM ignoring the many positive ecological contributions these horses make to this unique ecosystem? In related fashion, why are they ignoring the horse as a deeply rooted returned native in North America? I have given my well-rounded book, “The Wild Horse Conspiracy,” to this BLM office, but it appears they have not given it an open-minded read. In it are proofs concerning how wild horses restore nutrient-rich and moisture-retaining humus to soils and disperse and aid germination for a wholesome variety of seeds. These benign ecological roles are played by horses to a greater degree than ruminant herbivores, such as cattle, sheep and deer. Thus, horses help ruminants. And in a wild-horse-containing ecosystem, more balanced interspecific relations benefit the threatened sage grouse. I have observed this. Why are established interests ignoring these greater perspectives? Wild horses also facilitate catastrophic wildfire prevention — of life-or-death importance today due to global warming! They munch down the grasses that during drier seasons can become thick and widespread tinder, leading to serious fires — and they can do so in rugged, rocky and steep areas where livestock do not reach. When a wild horse population that has been for generations adapting to an ecosystem, such as the Pine Nut Mountains, is suddenly gutted, a serious imbalance is created with harmful consequences. All it takes then is one campfire spark, lightning strike, or whatever to destroy millions of plants and animals, often leaving soils sterilized to deep levels. In many areas where wild horses have been removed, very intense and extensive wildfires have occurred, leaving greatly damaged ecosystems. Many years, even centuries, of being left alone are then required for these to recover. As my life progresses, I have learned not to take for granted many things. So it disturbs me when I see government officials/public servants ignoring the legal rights and ecological benefits of wild horses in order to accommodate backward lifestyles and overly limited values. The great majority of people living in and around the Pine Nuts greatly value the special wild horses living here. They appreciate their “being themselves” in the more balanced, species-diverse world of Nature … being “free.” This lends a special quality to their lives here. Why are their public officials/servants not listening to them? The Pine Nut Mountain HMA deserves a much greater appropriate management level than 118 to 179, which is not even genetically viable! And 775 horses for such a vast 40-mile range, even in the cut-in-half HMA, is not overpopulated, though arbitrarily termed so. The Pine Nut Mountains easily have niche space for over 1,500 wild horses, and there were this many thriving and contributing horses in the past, and the range flourished because of their presence and had a special magic. I remember these days! Detractors use words to discredit the wild horses in order to topple their right to their natural niche in the Pine Nuts. But words incorrectly applied become deliberate distortions, even lies. The announced BLM Pine Nut roundup, or gather, should be called off, and the BLM should be required to uphold the Wild Free-Roaming Horses and Burros Act in this spectacular, biodiverse desert range. Ways and means exist to work out the obstacles. People can learn to share the land and freedom with such magnificent and highly evolved beings as the wild horses! Not one bit of justification. Wild Horses, contribute so much to the ecosystem. They live there in peace. Isn’t there one ounce of caring, by the BLM!! NO! BLM Nevada and Utah OUT OF CONTROL! They are removing more and more horses each week! Unnecessary removals based on BLM lies. Every point you have made, I agree. But, how do you stop this government department who answer to noone, doing the bidding of, dare I muse, the president. BLM need to be stopped, their harm to the wild horse herds and environment is irreparable. THE ANSWER IS CONGRESS CONGRESS CONGRESS!!! The BLM answers to no other authority, not even the higher one. Except Congress is in bed with lobbyists who are in bed with these companies….. There are 325 million US citizens, 100 million of those eligible who did not vote in 2016. The most power in this country is in our people, not the few fattening each other at the public trough. If your Congress people are not responsive, VOTE THEM OUT, HARD AND FAST. There is more at stake than our wild horses in these times, citizenship is a duty, and our freedoms are NOT FREE. The main problem is the BLM is in the cattle ranchers pockets so they remove these beautiful iconic horses to provide more free grazing land for cattle. Not to mention the money they recieve from kill buyers who buy these animals for pennies on the dollar. The BLM doesn’t give a damn that these horses are inhumanely rounded up, sent to kill pens, bought by kill buyers, them inhumanely transported to Canada and Mexico for inhumane brutal slaughter for human co consumption. The BLM is one of our countries most corrupt part of this discusting current administration! This crap was going on long before this administration took over, way long! True – but it’s much more now. When did any admin ask to shoot wild horses in holding or on the range. When did an administration ask to spay wild mares on a large scale before this one. What’s wrong with this picture: around 18,000 grazing permits on public lands, and around 325 million US citizens being fleeced by these permit holders. They are only getting away with this because they can, and the only way to change this is to get enough people concerned enough to do something about it besides blaming the BLM, who ultimately work for US. It is wrong to expect them to give a damn when voters don’t. Congress has to listen to the people, but they won’t unless and until enough voices get loud enough for them to hear. Thanks for sharing my article about th shameless act of cruelty and injustice that is now occurring in the spectacular Pine Nut Mountain 🏔 Wild Horse HMA. It is extremely cold and icy here this morning wit a lot of snow on the ground. The helicopter driven wild horses could frost their lungs, protracting pneumonia! Slip on the ice and snow or smash into snow covered rocks. This roundup is an abomination! I pray it will stop! It is everything that is wrong today, based on lies, and unbridled selfishness and greed! The Earth’s natural world and animals are being destroyed by the unfettered out of control capitalism which I hate to say because I’m not sure what the alternative is in this country. 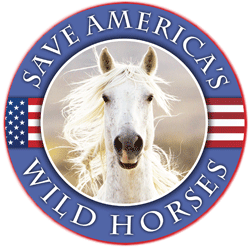 If you support wild horses as well as all creatures wild then you certainly can’t support an administration that is gutting all of the environmental laws put in place since the 70’s or so. Today on NPR they discussed a report that just came out of the mass extinctions of insects that is happening now. If left uncontrolled the Earth will have no insects and vital microcrobial species by the next century if not sooner. Well folks that will the end of life as we know it. But before that it will be literally hell on Earth! But don’t worry the most extreme elite will have their billions to eat! If BLM removes as many horses as they can find, per their goal of 575, it is likely that the cull will result in an extirpation — a regional extinction. Why? Because BLM’s population-figures are bogus. From independent studies on wild horses, we know that, on average, the foaling rate is 20% or less, at least 40% of foals perish, and at least 10% of adult herd-members die off every year. Thus, a high-normative population-increase would be 2%. Note how such errors compound. Note especially that, for a herd to grow 92% in one year, in order to overcome the respective foal-and-adult mortality rates, that would require every filly and mare to give birth to triplets. The incidence of triplets in horses is 1 in every 300,000 births. Managing for EXTINCTION is exactly what they are doing! Thank you, MaryBeth for showing these startling figures that prove corruption and fraud within the BLM. As a lifelong horseperson, I’ve never heard of triplets created by natural breeding, and even twins are rare, and though some survive, usually one will die soon after birth. I find the 92% increase you listed highly suspicious, as that nearly doubled the herd in a single year. Either the earlier counts were extremely faulty (raising other suspicions) or more horses were allowed in or shipped in from other places. None of this inspires confidence in their management. Does anyone with a good working knowledge of the Pine Nut herd agree with and can explain that 92% increase? Yes, you are seeing it for what it is. The numbers that Marybeth is stating come from the fraudulent populations that BLM gives to the public and to congress and they are lies! That was her point. GG, thanks. I was wondering if a citizen familiar with the Pine Nut herd could confirm or contradict the BLM numbers, as they are out of scale (if true) and point to a massive influx of new horsss or fraudulent accounting. Only those on the ground there would know first hand (or first hoof!). Mary Beth Devlin, can you post links to the studies you are referring to? Thank you. same issues in the Onaqui range in Utah. 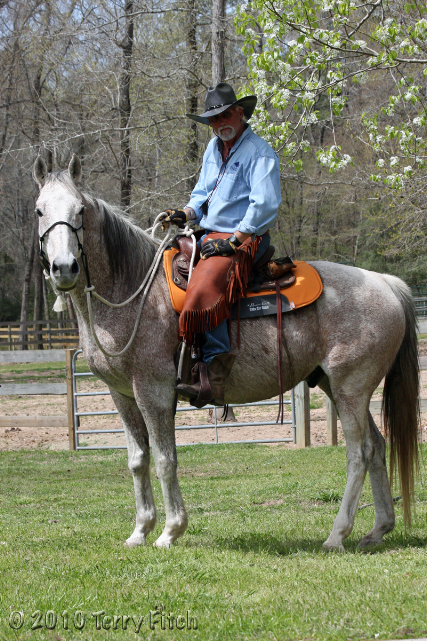 The horses are in excellent health as is the range except where decimated by cattle and sheep. The BLM (Matt parsons) is a liar and is obviously in bed with the livestock interests. He could care less about the thousands of comments against rounding up 91% of the herd leaving genetically devastated. Time to stop being nice about this. It is a fight for the survival of this valuable resource. Let congress know this is unacceptable and that when the BLM people lie to congress it is a felony and they should be prosecuted. Also the Catoors and others who profit from the cruel helicopter roundups should be put out of business and prosecuted for cruelty to animals. Only then will the wild horse have a fighting chance for survival. 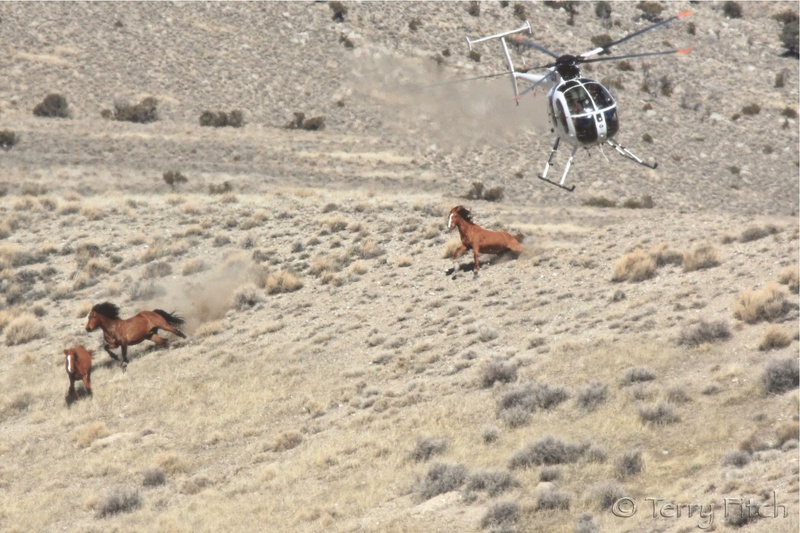 Helipcopter roundups should already be illegal, and no contracts valid, as they utterly fail the dicates of the law requiring the “minimal feasible management” of our wild horses and burros. Million-dollar helicopter roundups fail this very clearly, so should be challenged in court and abolished as an illegal practice. IF these numbers are correct, average first winter foal survival rate is 31%, though we don’t know how many mares or foals died, or even how many overal mares exist in the Pine Nuts, so these numbers only show those rounded up, and not all the mares caught may have had foals at their side. Its especially curious how one day they caught high percentages of mares with foals, and on another day far lower percentages (13% to 42% is a hefty spread under equal range conditions). Just looking at overall numbers captured: 209 mares and 60 foals, this comes to just under 29% replacements in the herd, pretty far from an “explosion” and if one believes all these mares are always pregnant, this means about 70% are either not reproducing or are losing foals on an annual basis. Leave these beautiful wild horses alone. They deserve to live free and wild. Wild Horses are the most Honest Creatures. What a tragedy that they they are neighbors with the government buildings as in Rural Nevada! The reasons “the officials” give for the need for a round up are insulting at best!!! These number of wild horses left in the world is low now and you are failing our for our grandchildren!!! WTF- the “officials” say the horses will consume the sage grass(?)! Yet, there is still sage grass all around. Who is to say Mother Nature did not create that sage grass for the Wild Horses(?)!!! Next, I am waiting for our government to next say they will be destroying all the Polar Bears because they use Ice.